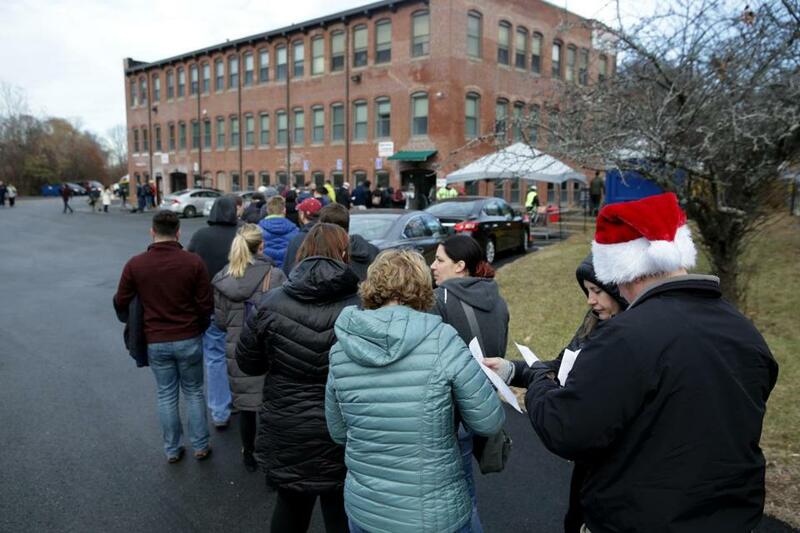 Customers lined up to make purchases of recreational marijuana products, at the Alternative Therapies Group marijuana dispensary in Salem at its opening in December, one of four companies that have reached agreement with the city on marijuana sales licenses. A marijuana company is trying to stop Salem from allowing a competing store to advance toward opening, saying in a lawsuit that the city unfairly rejected its application. The city says it had the right to pass over the firm, Mederi, in picking five cannabis shops out of nine applicants. A judge on Friday will hear Mederi’s request for an order stopping the city from entering into its fifth and final contract with a pot retailer. The lawsuit, which observers say is the first of its kind in Massachusetts, could test the limits of local governments’ freedom to choose winners and losers in the pot business, a growing industry since recreational sales started in November. While the state approves marijuana retailer licenses, municipalities are responsible for approving host community agreements, a requirement for a license. The store, Northeast Alternatives, will open on Sunday for recreational marijuana sales. 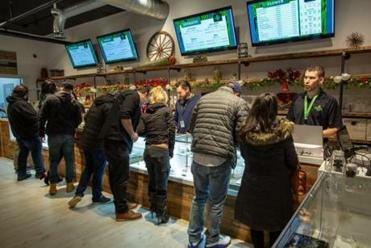 Like Salem, many cities and towns must winnow out a crowded field vying for few cannabis retail slots. Guidance for such places published by the Massachusetts Cannabis Control Commission doesn’t specifically address how to narrow the field of applicants. But it does suggest that municipalities use host agreements to allow some of their medical dispensaries to move forward with recreational sales. Other municipalities may not face the same types of lawsuits by rejected stores that Salem faces. That’s because Salem handled its approval process differently than others and rejected firms would often rather avoid appearing litigious and seek better luck elsewhere, said Valerio Romano, a lawyer who helped Mederi apply but is not involved in the lawsuit. In court documents, Salem said its process was similar to those of other municipalities, and it stood by its method of deciding among the applicants, six of which — including Mederi — were seeking to open on Highland Avenue, a busy commercial street. “The City has appropriately exercised its power to decline to enter into a host community agreement with Mederi in favor of other applicants which the City has determined present fewer negative and more positive impacts,” the city said in court documents. Last March, Mederi secured a lease on a site at 250 Highland Ave. and notified the city that it intended to apply to the commission for a marijuana retail license. Mederi also applied for a special city permit to open a cannabis store, which it received in August. Meanwhile, Mederi had sought to enter into a host community agreement with the city, the lawsuit said. Such local agreements are required to apply with the cannabis commission for a state license. But the city required the company to have a special permit before it would consider its application for a host community agreement, according to Mederi’s lawsuit. That differs from the process in other places, said Romano, because the special zoning permit process can be very expensive as it entails hiring an architect and engineer. In the 50 or so other towns and cities where Romano’s firm, Vicente Sederberg, has worked, marijuana companies obtain a host community agreement and then seek a special permit, he said. “Salem’s the only one making you spend all that money before,” said Romano, whose firm had other clients in addition to Mederi go through Salem’s process. Salem’s application for a host community agreement requires a copy of a special permit, or a conditional one, from the zoning board of appeals, if one has been received, or evidence of site control. Romano said the purpose of the host community agreement is not to reject a site, but to set conditions on security measures, hiring practices, donations to charities, and payments from the business to the city of up to 3 percent of a company’s revenue, which is supposed to offset any costs to the city from hosting the business. After receiving the special permit, Mederi submitted an application for a host community agreement in September. All nine marijuana retail applicants received special permits, so Salem Mayor Kim Driscoll made the ultimate decision which five would move forward, the city said in court documents. Driscoll declined to comment on the pending lawsuit. In December, Mederi — and two other hopefuls that would have been on Highland Avenue — received rejection letters from the city. Without a host community agreement, Mederi could not apply for a state license. “At the mayor’s discretion, our goal was to identify the strongest possible operators in the least impactful locations and unfortunately yours was not among them,” the city told Mederi. In court documents, the city said it had no legal obligation to sign a host community agreement with Mederi or the others that received special permits. The law, it says, “leaves to the City the discretion” as to whether to move forward with a company or not. The city also said its process was similar to other municipalities’ and that marijuana companies could apply for host community agreements without special permits. Since April, the city’s filing said, Salem has told all applicants, including Mederi, that it would not “automatically enter into agreements with the first five retailers who received a special permit” and that the city would evaluate them to decide which would have the most positive impact. Mederi never raised an issue with the process or asserted that the city had overstepped its authority until after the retailer was rejected, the city said. So far, Salem has inked agreements for four of its five retail licenses. They are: Witch City Gardens on Jefferson Avenue; Atlantic Medicinal on Highland Avenue; Seagrass on Dodge Street; and Alternative Therapies Group on Grove Street, which has been selling recreational marijuana since December.